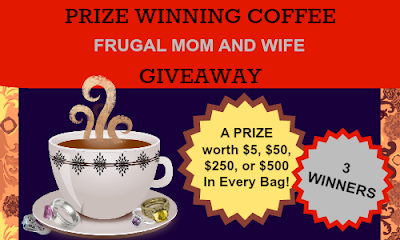 Frugal Mom and Wife to bring you this awesome giveaway!! When I was little I just loved getting prizes inside my cereal. Then growing up lead me away from cereal and more towards coffee. That's why I turned to Prize Winning Coffee. jewelry, or a coin from around the world, that is worth $5, $50, $250, or $500! I jumped on the chance to review their coffee and was surprised more than once. The aroma the coffee filled my home right away with bold roast. I love that smell and that's a sign of a great strong coffee!! I shutter at most coffee's if it doesn't have my sugar and creamer but this one is smooth. While enjoying my coffee I quickly emptied the contents of the bag to find my prize. 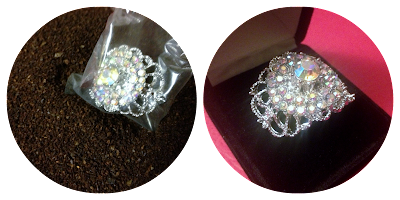 Inside I found a beautiful vintage adjustable costume jewelry ring! I can't wait for my next bag! You actually can choose what type of prize you'd like inside! Prizes inside products aren't just for kids anymore! Do you love prizes? I sure do and coffee! When you put them together... you get delicious Prize Winning Coffee! Find out all about them on their Website and Facebook Page. Here is your chance to WIN your very own BAG of Coffee with a prize inside!! 3 Winners will each win 1 Bag of Prize Winning Coffee! It's a prize within a prize, how awesome is that? Simply enter using the Rafflecopter below, every entry is another chance to Win! Don't forget to come back for daily entries! I would love to see what awesome vintage/estate jewelry I would get! I would like the coins or a surprise! A surprise or coins would be grreat to win!